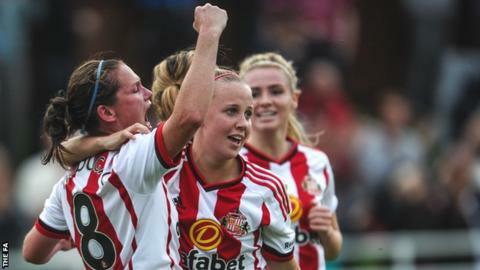 Kelly McDougall scored a late equaliser against Liverpool at Hetton-le-Hole to help move Sunderland a point clear at the top of the Women's Super League. Beth Mead opened the scoring from the penalty spot after Liverpool's Becky Easton fouled the striker in the area. Natasha Dowie responded before the break, lobbing goalkeeper Hilde Gunn Olsen from 30 yards. Rosie White beat Olsen one-on-one to put the Reds ahead on 68 minutes, only for McDougall to rescue a point. In a flurry of injury-time chances Lucy Staniforth hit the post with a free-kick for Liverpool and Katrin Omarsdottir missed an open goal on the rebound, while White and Mead also had opportunities to win it. The victory sees the Lady Black Cats move a point clear of Arsenal at the top of the table, but the result means both the Gunners and third-placed Chelsea can go above Sunderland with wins on Sunday. A point leaves Liverpool sixth in the table and five points above the relegation spot with four games remaining. Sunderland Ladies: Olsen, Holmes, Bannon, Williams, Greenwell, Ramshaw (Kelly 72), Furness, McDougall, Chaplen, Roche (Joice 64), Mead. Liverpool Ladies: Stout, Harris, Bonner, Easton, Pacheco (Schroder 73), Omarsdottir, Staniforth, Hodson (Smorsgard 62), Longhurst, White, Dowie. Substitutes: Darbyshire, Ryland, Dale, Zelem, Green.